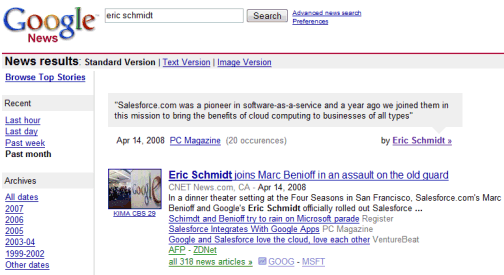 Google News can now detect quotes in news articles and attribute them to their authors. If you search for people like Eric Schmidt, Pope Benedict XVI, President Bush, Angela Merkel or Fernando Alonso, Google News will display a relevant quote and a link to other quotes from recent news articles. You can search inside the quotes, sort them by date, restrict them to the last day or the last week. Unfortunately the links to quote listings aren't very descriptive (here's one example) and there's no option to find the quotes related to a news cluster. 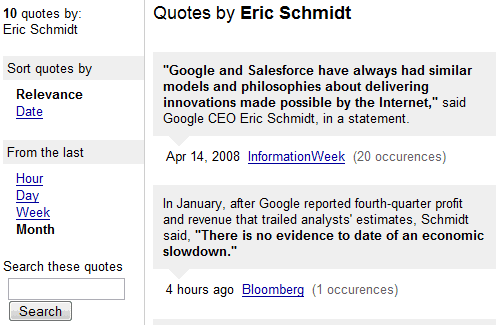 By default, Google sorts the quotes by relevance and gives more weight to the quotes that are used often. This is awesome. Quoting Bush, awesome. The quotes I find all seem to be of a political stance. They're selective quotes. For example, in Canada there has been a "robocall scandal" where the Conservatives are suspected to have have disrupted citizens from voting and effectively nulling democracy in this country. However, when you search "Stephen Harper" under News, our prime minister, you get a quote from him saying that it was the Liberals; which is of course misleading. You also get a Wikipedia article at the top, which isn't News at all. Makes you wonder who's controlling Google.